Saturday Night @ The Fifth Annual Amber Birthday Extravaganza! 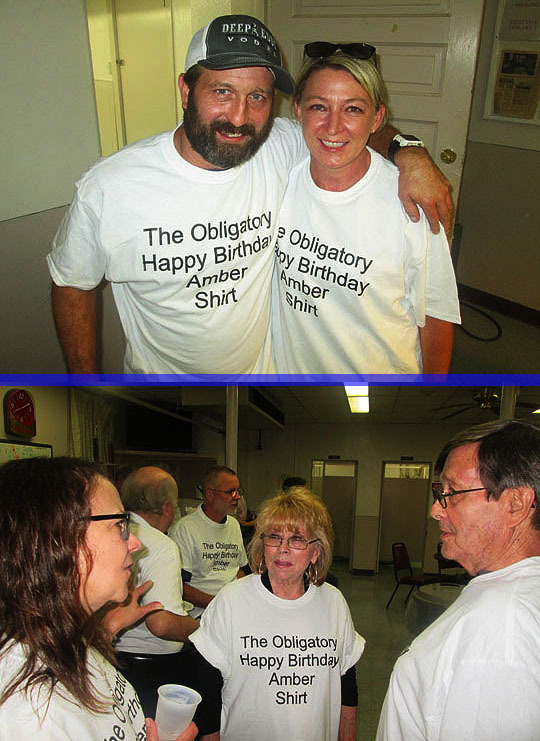 Live, from Peoria, Illinois, it’s Saturday Night at The Fifth Annual Amber Birthday Extravaganza starring Amber, Joe, Diane, Chuck and a whole crew of jovial birthday party guests! Now please welcome the birthday girl herself, Amber Bohannan! Here’s the guest of honor, Amber with her husband Joe and her parents, Chuck and Diane. Time to start the fifth Amber birthday party! It’s hard to believe it’s been four years of these parties. It all started with bags of frozen food back in 2014! A bar! Our bartenders for the evening are Chris and Jim and they’re both really nice and friendly people. This is such a fabulous place for a party and if you’d like to rent it all the information is right here! 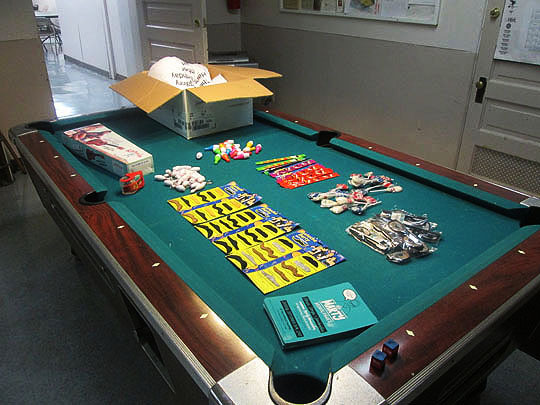 To go along with the bowling alley party theme we had bowling party favors, a box of Obligatory Happy Birthday Amber t-shirts and of course, fake mustaches! 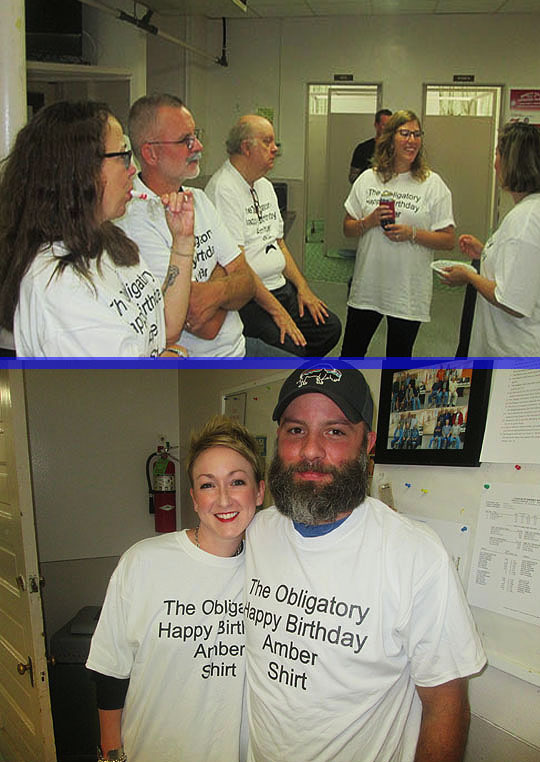 Here’s photos of the guests that came to the party: Steve, Steve and Kathy, Kathryn and Jeremy, Loni and Steve, Ryan and Jordan, Brian and Michelle, Danielle and Brent, Jon and Adam. As you can see, no one was shy about putting on the fake mustaches! 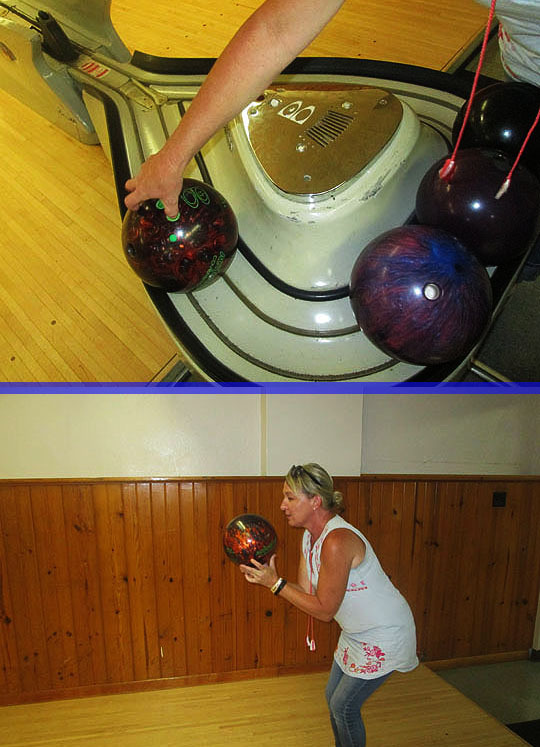 Amber started off the bowling with her winged bowling shoes and Donald Trump socks! 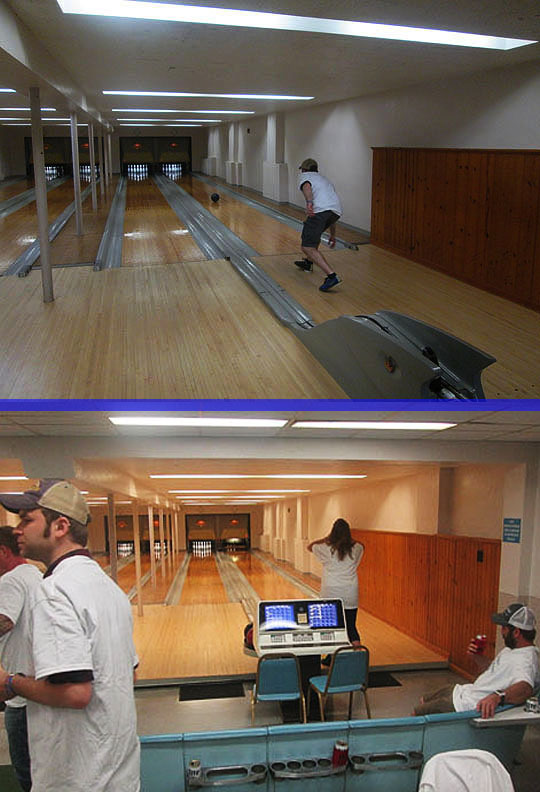 After she bowled the first frame, everyone else joined in on the bowling fun! Danielle’s birthday is close to Amber’s so every year I get them dueling presents and it’s a lot of fun to watch them opening them up! Even though people were told not to bring presents, Amber got some really nice gifts from the generous guests. My personal favorite is this ukulele that Kathy designed and painted! How cool is that? And she serenaded Amber with the happy birthday song! You can check out more of Kathy’s ukelele art right here: Hippie Girl Ukuleles. Of course we had to get a custom Trefzger’s birthday cake for Amber and the MBIP Trefzger’s cake artist, Kayla designed and made a special bowling cake to go along with the theme of the party. Kayla incorporated photos of Amber and Joe’s wedding reception which happened here at St. Ann’s just about a year ago. The cake reads: “Happy Birthday to Amber, The Bowling Bride.” And under a picture of Amber and Joe is this inscription: “Happy Early Anniversary to Mr. and Mrs. Bohannan.” Kayla did wonderful work on the cake, as always! The bowling candles were lit and Amber blew them all out and hopefully all her wishes for this year come true! 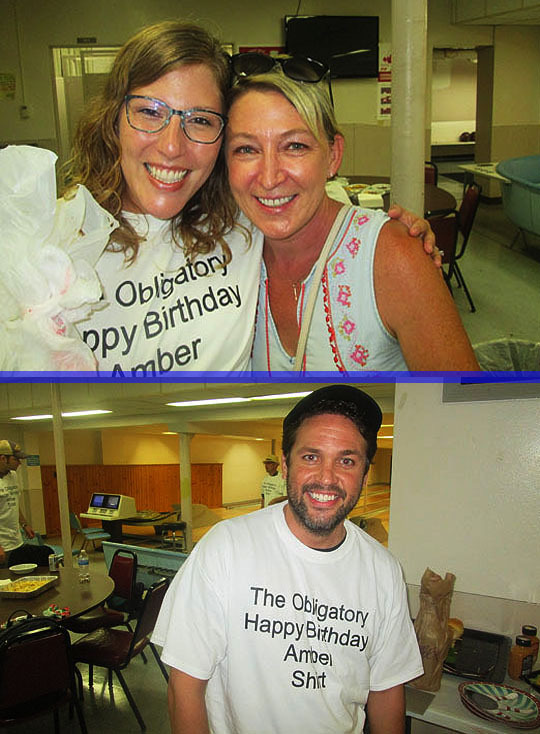 Thanks to Chris and Jim from St. Ann’s, everyone who came to the party and Happy BIrthday to Amber! i’m looking forward to next year’s party already! Evgeni Plushenko the Wonder Guinea Pig is have his own dress-up party with this outfit by Loni! Related Posts: Saturday Night Microwave Buffet @ Amber’s Birthday Party!,Saturday Night @ Amber’s Birthday Party...Plus...The First Annual Amber Birthday Pizza Delivery Derby!, Saturday Night @ The Third Annual Amber Birthday Extravaganza! Featuring Dave “Elvis” Stovall And A Half A Dozen Birthday Cakes! and The Fourth Annual Amber Birthday Extravaganza.